Wireless lectern accommodates audiences up to 1,500 people in rooms that are up to 15,000 square feet in size. Built into a durable case, the 50-watt multimedia stereo amplifier with built-in receiver has three mic inputs, and a line input for music, computer projector, laptop—plus it has a line out to record. A dynamic gooseneck mic with 15' cord and shockmount mic holder assures voice clarity. A wireless lapel mic plus transmitter are also included. Features two built-in Jensen-style speakers and extra speaker jacks. Four casters let you roll it wherever you need it, then two locking casters secure it in place. Two large storage shelves stow a laptop, binders or notes. Wireless lectern can be powered with an optional AC adapter (item number APL1460) or powered for up to 200 hours with 10 D-cell alkaline batteries; rechargeable nicad battery pack (item number APL1465 requires item number APLS1460). A portable solution for presentations, speeches, lectures and more. Perfect for boardrooms, meeting rooms and auditoriums. Wireless lectern accommodates audiences up to 1,500 people in rooms that are up to 15,000 square feet in size. Built into a durable case, the 50-watt multimedia stereo amplifier with built-in receiver has three mic inputs, and a line input for music, computer projector, laptop—plus it has a line out to record. A dynamic gooseneck mic with 15' cord and shockmount mic holder assures voice clarity. A wireless lapel mic plus transmitter are also included. Features two built-in Jensen-style speakers and extra speaker jacks. Four casters let you roll it wherever you need it, then two locking casters secure it in place. Two large storage shelves stow a laptop, binders or notes. 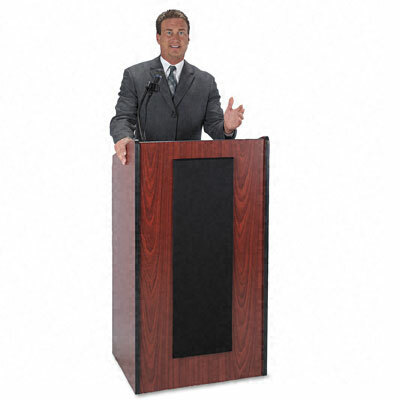 Wireless lectern can be powered with an optional AC adapter (item number APL1460) or powered for up to 200 hours with 10 D-cell alkaline batteries; rechargeable nicad battery pack (item number APL1465 requires item number APLS1460).